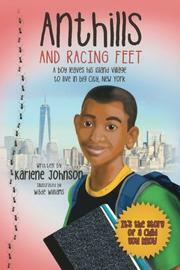 A boy from Jamaica has trouble adjusting to his new life in New York City until he finds a talent that others respect in Johnson’s chapter-book debut. Junior loves his home in Sunset Village, Jamaica, and his grandmother. He’s nervous about having to say goodbye to move with his mother and stepfather to New York. Will America change him? Will he be like Troy and David, friends who left the island and returned unwilling to be active or get dirty? Will he have to learn to talk funny? Worse, when he arrives in New York, it’s nothing like the “heaven” he expected: “There were not even any real trees or flowers….Here and there a strange, sick-looking growth pretending to be a tree leaned with determination away from the draft of oncoming city traffic like ‘One-leg Willie’ on a busy afternoon in Sunset Village.” He finds a friend in Doug, who was born in Guyana and shares some interests, but neighborhood children call the pair “those crazy West Indian kids.” Things at school are even harder, as Junior finds himself the target of a bully. But eventually Junior discovers two strengths that help him fit in: his skill as a runner and his courage, both of which he can express through track. Johnson’s voice rings true to the immigrant experience; she’s an immigrant, and Junior’s coming-of-age story is based on her son’s experiences. Junior’s first-person narration uses evocative imagery from Jamaica, and the cadence of his words feels authentic for a fourth-grader. Despite the tale’s focus on immigration, even students who have never been to another country should identify with Junior’s struggle to belong—especially children targeted by bullies. For those who have immigrants in their classrooms, this book provides an excellent way to start conversations about moving to another country and learning to adapt. Williams’ black-and-white illustrations perfectly match the tone of the chapters and capture Junior’s adjustments. A strong tale about an immigrant’s experiences for older elementary school readers.